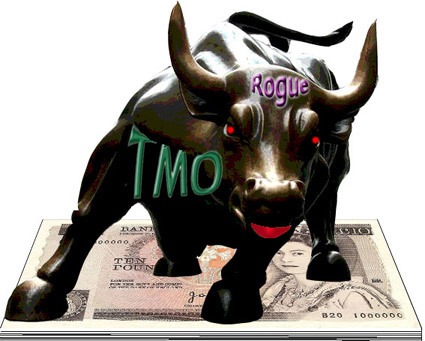 There are many opportunities for TMOs to go Rogue. The law is weak. Council control is very limited. Leaseholders and Tenants may have conflicting aims. Residents - that's us - rely on honest, fair people to comprise the TMO Board of Directors. Favoured Leaseholders can be "let off" service charges. This is corruption that the Council cannot ignore and is often the trigger to take back the rogue TMO into Council control so the leaseholders end up having to pay the charges anyway. The proTMO group have made numerous complaints about the NoTMO group and its members directly and to the Council, the Police, the Police Community Support Officers and our former webhosting company. None of these complaints have ever been upheld. The only formal complaint (aside from the emails about defamatory material - see below) the the NoTMO group have made was about the flyposting of the estate by the ProTMO group. That complaint was upheld on 5th November 2009 by Area Estates Manager Tunde Akinooye who advised the TMO not to flypost the estate. The posters were removed by Council cleaning teams - normally this cost would have been borne by the organisation, £7,200 (according to Council procedures £100 per poster removed) but the TMO was not charged for their misconduct. The mysterious events surrounding the apparent loss of £18,788 in 2006 have never been cleared up satisfactorily. Southwark Council never investigated the loss, according to the Freedom of Information Act document which is here. Until this has been cleared up we do not see how any meaningful ballot can take place. At the last TRA AGM on 30.6.2010 it was revealed by the TMO chair (who is also a member of the TRA Committee, which we believe is a conflict of interest) that the TMO has not in recent years paid anything for the use of the TRA hall, in contravention of the agreement that the TMO would pay £500 per year for its use and the office facility that the TMO has in the TRA hall. So the TMO is not paying rent or service charges. This document seems unsatisfactory. Among the improvements we deem essential are: term limits for officers or committee members, a maximum limit for committee members (so that committee members can be "voted off" if their performance is deemed unsatisfactory by residents), a register of committee members interests and provision for Conflict of Interest declarations. Joining an arbitration organisation might be a good idea too. The TMO 4 page "Business Plan"
This has been recently delivered to the whole estate. It is a wholly inadequate document, particularly in terms of the time and money invested in the "training" of the TMO committee, because it does not have any financial information in it. The proTMO group are secretive and do not identify themselves on their leaflets. During the period 2008-2010 they have held no public meetings aside from their AGMs and the "Fun Day" in the park (5.9.2009) - neither was suitable as an event to debate the activities of the proTMO group. The TMO Chair complained to the Police Community Support Officers and the Council about the presence of NoTMO group members in Leyton Square Park (a public place) and a video made by the NoTMO group of him; those complaints were rejected. The video can be seen here. On three occasions a member of the NoTMO group (Julian Jackson) has asked the TMO Chair to debate with him at a public meeting (at a TRA committee meeting on 8.4.2009; the TMO AGM on 28.9.2009, and in a subsequent email). The TMO chair has declined. The Chair of TMO has attempted on a number of occasions to suppress the NoTMO website and have information removed from it, including the Freedom of Information Act document which detailed the apparent loss of the £18,788 to the trainer who left the country. Because of the harshness of the UK libel laws and the Demon Internet case, our former hosting provider advised us to remove the material from our website and we have reluctantly complied. We stand by the veracity and honesty of the material we put up on this new website. We regard the suppression of free speech and legitimate criticism of the proTMO group's activities to be scandalous and which will have consequences as we do not intend this to go unnoticed. The proTMO group also control the Unwin and Friary TRA and the Chair of the TMO/Vice Chair of the TRA/Leaseholders representative, sits on various committees and we are never sure which function he is representing at any one time. As it is the TRA representatives who are going on Estate Inspections with council officers, even though they may also be TMO committee members, we think the Independent Assessor has been misinformed that the TMO inspects the estate. We are concerned that TMO leaflets often claim to have raised money for the estate which the TMO have had no practical part in, and these projects would have existed with or without the TMO. Two of the proTMO leaflets have been deemed defamatory of the NoTMO group, although neither identifies us directly. The first defamatory TMO leaflet was flyposted around November 2008. It is our understanding that the TMO group was warned by Council Officers not to produce any further defamatory material or use council premises or facilities to produce material which puts the Council in legal jeopardy as "publishers" of libellous material. Nevertheless in August 2010 defamatory notices accusing the NoTMO group of being "Liars" appeared in Council noticeboards and it is our information that this poster was produced using Council facilities without the knowledge of Council Officers supervising those facilities. Following a strong email from the NoTMO group, these notices were immediately removed from the Estate noticeboards and the TMO has been prohibited from using those noticeboards to campaign. However this does not actually remove the threat of legal action and the NoTMO group has been consulting a specialist firm of libel lawyers. Clearly this is a Rogue TMO.